Newly Renovated Hotel in Sheboygan, WI Boasts Ideal LocationSituated just off I-43, the Holiday Inn Express hotel in Sheboygan, WI offers guests both comfort and convenience. Countless area businesses and popular local attractions can be found not far from our hotel. 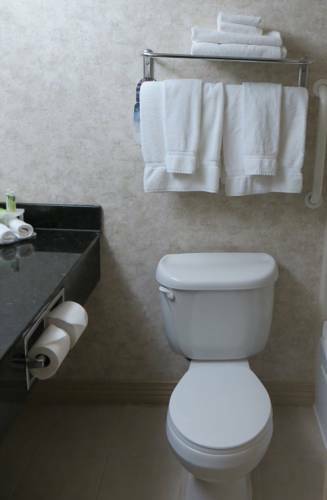 Business travelers appreciate our Sheboygan hotel's location near many important businesses such as Acuity, Johnsonville Sausage, Kohler Co., and Bemis. We also offer free high-speed, wireless Internet access, and a 24-hour Business Center so guests can get work done while on the road. Our hotel in Sheboygan, WI is also ideal for families as countless exciting attractions are within a few miles of the hotel. The Sheboygan County Historical Museum, Weill Center for the Performing Arts, and Kohler Arts Center are a few of the cultural venues nearby. Kids love paying visits to the Above and Beyond Children's Museum and Breaker Bay Water Park. With so many great entertainment options visitors never have a lack of fun things to do in Sheboygan. Our hotel's many convenient amenities include an indoor pool, 24-hour Fitness Center, free 24-hour coffee, tea, and hot chocolate which is sure to make you feel right at home. For the best service and accommodations in Sheboygan, stay at this Holiday Inn Express hotel.